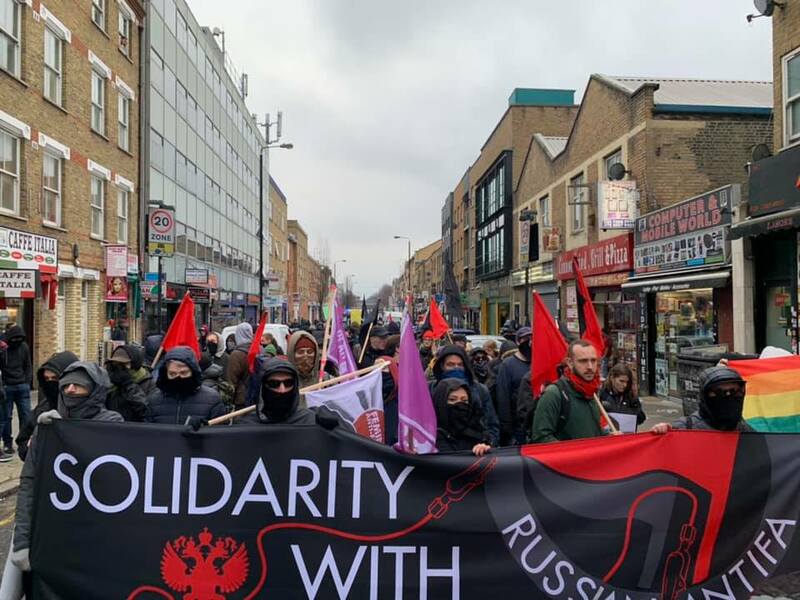 The event expressed solidarity with 11 Russian anti-fascists who have been arrested and tortured in detention in the so-called “network” case. These young people have been beaten up, struck repeatedly with electric shockers (like cattle prods), hung upside down and suffocated by security services officers. The London event was supported by: Anarchist Communist Group, Anarchist Federation, Brighton Anti-Fascists, Bristol Anti-Fascists, Brazilian Women against Fascism, Feminist Fightback, Labour Briefing, London Anti-fascists, London Anarchist Blackcross, North London Anti-Fascists, Plan C London and RS21. Short film of the London demo here. However, we have to understand that this Russian case is not a far-away exotic reality. If twenty years ago, the image of the post-Soviet world was one of a “catching up” with the so-called “West”, the imagination draws an absolutely opposite picture today: post-Soviet Russia is the future of the Western Europe, the shameful future of a capitalist society that went through a series of geopolitical, economic and political crises, severe austerity measures and a rapid dismantle of the welfare state. He took part in human rights conferences and social forums, trying to unite the ideas of human rights and social justice. Let’s not forget Stas and Nastya's struggle. This article also appeared on People & Nature.